Up in Northern Michigan, the rally action is as furious as ever. Join us below for our mega gallery of what can only be described as Michigan's great motorsport secret. Michigan is home to both the start and end of the yearly RallyAmerica racing circuit. The 2008 season came to an end in Houghton, Michigan last October at the Lake Superior Pro Rally. The fresh 2009 season begins anew here in Atlanta, Michigan during the dead of winter. Snowmobiles and 4x4 trucks aren't just a convenience in Atlanta - they're a necessary facet of life. Good thing we were locked, stocked and two smoking cameras while rolling in our Roush Propane-powered F-150. This time we were pushing giant steamroller tires on chrome wheels as the factory hides met a smokey demise at an earlier date. The rally went down as a classic snow rally with plenty of snowbank-Plinko and lots of off-course sliding. Spectators were quick to jump in and assist when drivers chose to jam their cars firmly into the stout, powdered walls. Our rookie favorite of last year Kyle Sarasin was stuck in an old front wheels-driven Mitsubishi Eclipse after his previous yellow Subaru-wielding team was disbanded. The title of Most Jalopnik Rally Car of this event was taken by Greg and Tom Woodside in their turbo 1987 Dodge Shadow. 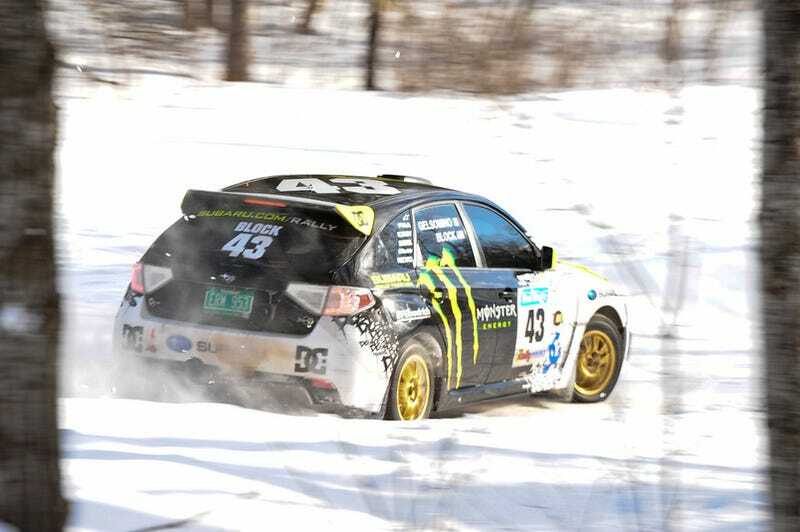 After a short battle with Travis for the lead, Ken Block was knocked out in the first day with a mechanical failure as a result of a minor crash. Travis Pastrana and Christian Edstrom secured the first place finish while Tanner Foust and Co-driver Chrissie Beavis locked in the second rank in their Hyundai Tiburon. Andrew "ACP" Comrie-Picard and Marc Goldfarb snuck into third place after fighting against some handling problems in their Mistu Evolution IX. BMX baddie Dave Mirra pulled in a strong 6th-place finish. Keep an eye on our RallyAmerica tag as we'll soon be following up with an exclusive behind the scenes look at Subaru's Rally Team, a full HD video of Sno*Drift and Travis and Ken's In-Car video. We're stuffing our hatchbacks in preparation of the 100 Acre Wood rally in a few weeks time located in Salem, MO. Press on regardless!